I’ve been playing with my food for as long as I can remember. But when asked when I started making sculpture out of food, I’m hard-pressed for an answer. What is clear is a single moment of pure inspiration: La Noche de Rábanos (Night of the Radishes) in Oaxaca, Mexico. 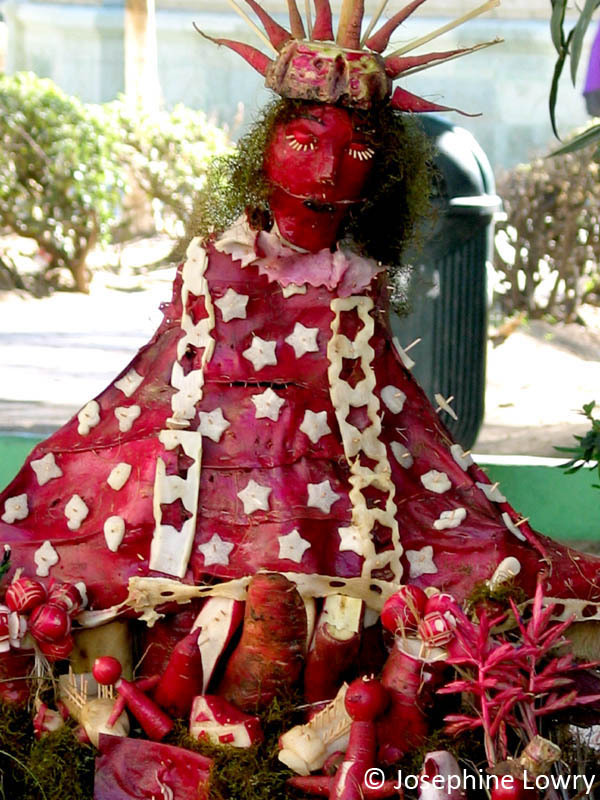 On December 23rd, artists and farmers gather in the zocalo (town square) and create ornate sculptures out of radishes. The sculptures range from a giant Jesus on the cross to the Procession of the Rosary, from graveyard picnic scenes to amusement parks with radish swings. The creative use of what I consider highly unappetizing root vegetables is nothing short of awe-inspiring. Plus, when you factor in my unbridled love of the color red, I was in heaven. A heaven reigned over by a radish-based Virgen de la Soledad! The radishes used for this festival aren’t the bite-sized roots that you’d find at your local farmer’s market, they’re massive beasts that have been specially grown and left in the ground for much, much longer than normal. I suspect each farmer has his/her own methods for enticing growth as well as which shape yields the best outcome. Like all good folk traditions, the story of how this 100+ year-old festival started varies depending on who you ask. I was told that one Christmas, the townspeople discovered that a radish had been left behind and forgotten in the fields. When the farmer pulled it up, the radish bore a striking resemblance to the priest. He brought it to service and as the priest had a sense of humor, they displayed it. In 1897, the Mayor of Oaxaca formalized the exhibition into an annual event and it’s been happening ever since. What I love most about this festival is the underlying humor — the readiness to laugh is a trait that most Mexicans seem to share. 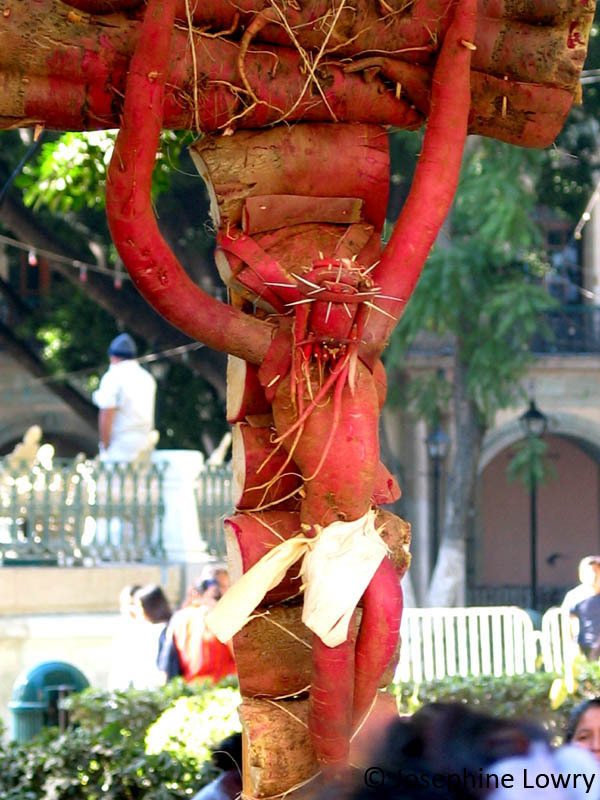 I’m in no way demeaning the deep faith of the Oaxaca Catholics and their elaborate Christmas celebrations, I can’t help but wonder if they don’t find some sort of humor in carving the little radish scythe that Death carries with him as he walks behind the cemetery cart. Or, the little radish nail that’s carefully placed into the radish Jesus’ palm. So. Stay tuned for more posts about meatloafs cakes, fruit monkeys, and peep murders. Oaxaca Cultural Navigator: Noche de los Rabanos. Josefiend, thanks so much for the mention and link to Oaxaca Cultural Navigator. With appreciation, Norma Hawthorne. You’ve got some great information on your site, Norma. @Ayumi – I’m using the “Suburbia” WP theme. You can get it here: http://theme.wordpress.com/themes/suburbia/.